Shorecrest Upper School’s Red, White, and Blue Club was founded this year with the mission to serve those who serve us. As a member of the club’s Executive Board, I am beyond proud of all that our club has accomplished in its first year. 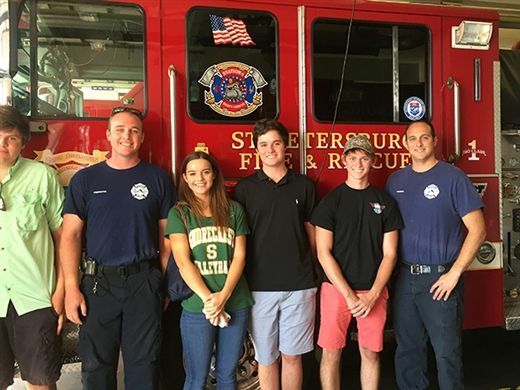 Partnered with the Wounded Warrior Project, the club has participated in multiple community service events helping veterans, police, and firefighters to show our appreciation for those that do so much for our community. Our most recent event, and the last event of the year, was a very special and rewarding opportunity. We decided to use the club’s funds to buy and prepare dinner for the firefighters at the local fire department. Mrs. Peck and I went to Mazzarro’s and bought four frozen lasagnas, fresh bread, and items to prepare a salad. Then, a few of the club members gathered at my house to prepare the dinner and we drove it over to the fire station on Fourth Street North that serves Shorecrest. At the fire station we were warmly welcomed by the fire fighters. They were very grateful and excited to have us. They kindly gave us a tour of the fire station, showing us the fire trucks, and answering questions we had about the jobs they do each and every day. We were all very excited to have this opportunity to learn more about something that is a vital part of our community and show our appreciation. Cooking dinner for the fire fighters was just a small gesture in attempt to show our immense gratitude for all that they do. In the coming years, the Red, White, and Blue Club will continue to serve those who serve us. We are very excited to continue the club in the future and hopefully spread the word and even expand it to other schools. I am so glad I got to help lead this club this year, as I believe the club’s mission is very important. It is amazing how many Shorecrest students are enthusiastic about this club, and I can’t wait to see all of the amazing things to come.